If you love spending time outside when the weather turns nice but aren’t very proud of your shabby looking backyard, don’t worry! Sprucing up your backyard can be simple and doesn’t need to cost a lot. Here are five practical and wallet-friendly upgrades you can do yourself. 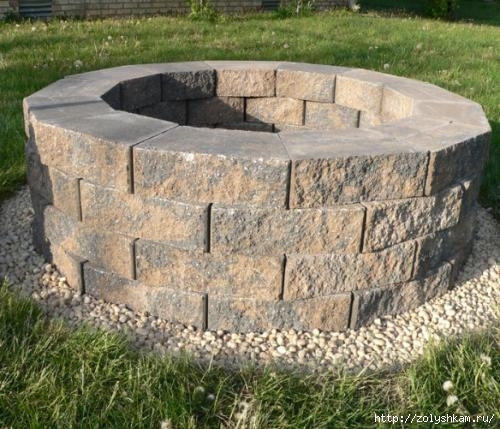 Build your own fire pit for around $50 by using concrete retaining wall blocks with rounded edges. They cost about $1.25 each at your local home improvement store. You'll need around 40 blocks to make a round fire pit with 10 blocks on each level. Use a shovel to dig down about 1 foot where you’ll lay the first level of blocks. Continue stacking the blocks up to five levels high, making sure each level is stacked so the blocks are centered on the crack below it. Adding string lights to your backyard space dramatically adds to its appeal. String lights above any sitting area, like in the trees above a fire pit or across the top of a pergola or covered patio. Don’t have a cover over your patio? Install poles at each corner of your patio and string lights from pole to pole. You can find outdoor string lights for as little as $15 per box. Use a green extension cord to reach spaces not near an outlet. If you’re going to be spending time outside, you need to make sure your patio furniture is comfortable and in good shape. Shop at a furniture store that specializes in outdoor furniture. Make sure cushions are clean and comfortable and give tables a good wipedown. It’s also a good idea to make sure you have plenty of seating. 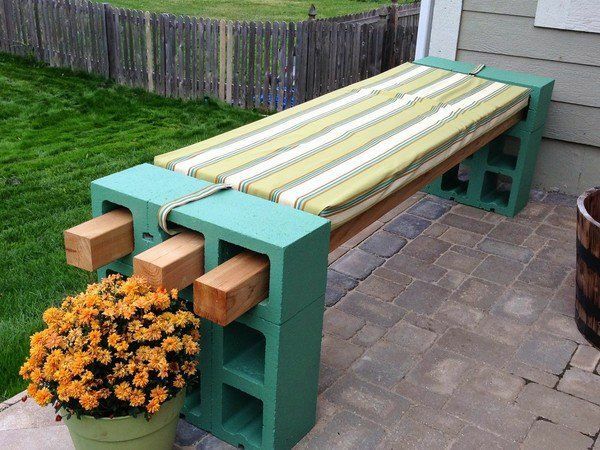 Cinder block benches are a cheap, quirky way to get creative and add seating to your backyard. You can put one together for around $40 using 12 cinder blocks (around $2 each), 4 pieces of lumber (2x4x8, around $3 each), concrete adhesive ($2.50) and a caulking gun ($2.50). Add cushions to make it extra comfortable. Edging with stone brick makes your garden look clean and keeps mulch or pebbles from getting into your lawn. You can get stone edging bricks for around $1.30 to $2.00 at your local home improvement store. You’ll need a small shovel or spade to break up the ground and a rubber mallet to hammer the stones halfway into the ground. Keeping your grass green can sometimes feel like a never ending battle. Regularly fertilizing, weeding and watering go a long way toward keeping your grass healthy. If you don’t want to maintain your lawn yourself, call a lawn care service company to handle it for you. Make sure you choose the right grass for your lawn by knowing which type works best in your climate and lawn’s sun exposure. Bermuda grass: Bermuda grass is great for hot climates and resists weeds the best due to its aggressive growth. It does well in full sun. Mow 1.5–2 inches high. Fescue grass: Fescue is a cool-season grass and works best in yards with full or almost-full shade. It survives cold winters well. It has many varieties that differ in heat-tolerance levels, so read the label before purchasing fescue seed. Mow it at 2–3 inches high. Zoysia: Zoysia is a warm-season grass that does best in full or partial sun. It has a high-traffic tolerance but requires more care than most grasses. Mow it at 1–2 inches high. St. Augustine: If you’re from Florida or other coastal areas with high humidity and sandy soil, St. Augustine grass will do well in your yard. It should be mowed at 2–3 inches high. Perennial Ryegrass: Ryegrass is a cool-season grass that does well in full sun. You’ll often see it mixed in with other grass seeds for overseeding. It should be mowed at 2–3 inches high. It’s good practice to overseed your lawn with the appropriate type of grass seed each fall or spring. This minimizes bare spots and keeps your lawn thick and full for patio season. A fertilizer spreader ($30) works great for overseeding your lawn in addition to spreading fertilizer. Professional lawn care companies will set a fertilizing and weed treatment schedule throughout the year. You don’t always need to hire a professional or spend a lot of money to make your backyard look great. These budget backyard ideas go a long way in making your backyard a nice place to entertain, relax and hangout. They’re easily maintained and can last many patio seasons to come. Happy DIYing!